Have you got some old tires lying there? If yes then have a look at these ideas and recycle them to make great DIY Tire interior and exterior décor. You can turn those old useless tires into something useful from furniture to garden planters to something fun for kids, too. As summer is around the corner. That means many of us are looking for new outdoor activities, play places and projects. 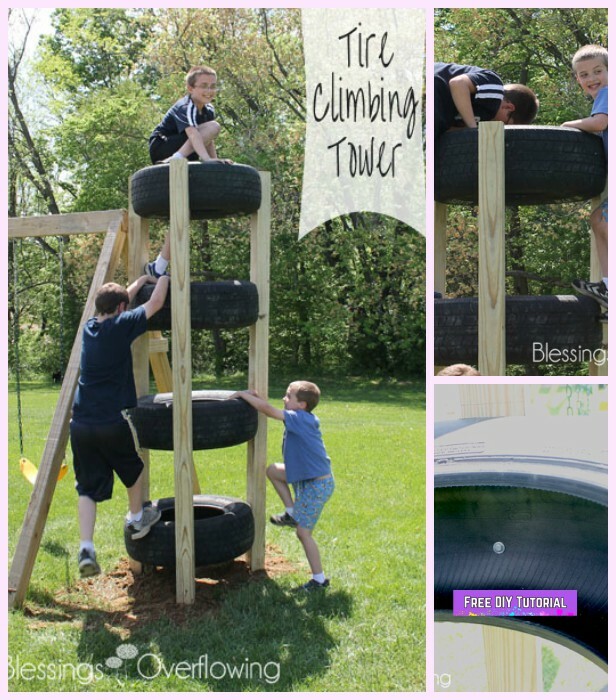 And this DIY Tire Climbing Tower will be your new hot spot for kids and their friends This DIY kids’ project requires some heavy lifting and serious hardware, so parental supervision is essential. This activity is a great idea for older teens or teachers to use as a community project for kids in need. Another perfect way for kids to enjoy some fun in the sun this summer. Be sure to drill holes in tires on the underneath so water doesn’t collect in there. This project was created and shared by our friend Jacki from Blessings Overflowing. She shares the step-by-step instructions, along with the full list of supplies. Click the link here to learn how: Blessings Overflowing – Tire Climbing Tower. More Ideas from google search, image source is lost, though.